Agatha Chang was the only daughter of James Chang, the MaeHwaRi Parish office manager in HwangHaeDo. Her family was very devout Catholic and she grew up imbibing this faith atmosphere from her parents. Her father, James Chang, loved to help out the poor and abandoned children. The family moved from HwangHaeDo to BackDong (present HeHwaDong) in Seoul. Here James got also the job of Parish office manager. As soon as Agatha was born, James gave her to his friend’s baby son in marriage. In old Korea, people often made such engagement deal between friends. This kind of promise was a very serious deal between two families. In marriage deals, the two young people’s opinions didn’t matter. It was strictly two families’ or two fathers’ matters. The two children grew up separately in the two families without ever seeing each other. When they were old enough to marry, the boy got sick with the TB disease and was critically ill, even dying. Then, the two families hurried to let these two get married because people believed at that time that a dead man without marriage could become a very ugly ghost who couldn’t settle in any place. Therefore, the two got married. The boy was very sick and totally bedridden. Their marriage was only in paper but still they were a couple officially. He died a few weeks after the wedding and Agatha became a virgin widow. James Chang cared for the poor in the BackDong Parish in Seoul and in the neighborhood. But his only daughter, Agatha who became a widow, wanted to enter a convent. Therefore, he moved to Wonsan for his daughter with his sick wife. He donated most of his wealth to Wonsan Convent. He bought an old house in front of the Convent and had some income just enough for his sick wife and himself still caring for the poor and sick in his neighborhood. Agatha Chang also grew up under the influence of such a father and had a very charitable and sincere character. In Wonsan, she took care of her sick mother. She went to the Convent in the mornings and noon hours. In the evenings, she came home to take care of her mother. After her mother’s death, her father remarried. Then, she stayed at the Convent for good and took care of all the lowly jobs of the Convent voluntarily. 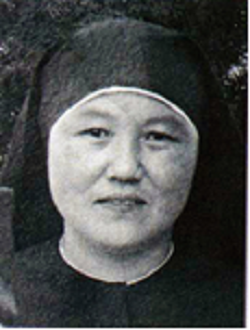 Sr. Magdalena Muro, who had been the only Japanese Sister in our Community and who passed away in 2003, witnessed that Oblate Sr. Agnetta felt sorry for her permanent postulant state, unable to be accepted into the final professed Sisterhood because of her unwanted marriage even though she had been virgin all this time and that whenever there was the ceremony of final profession, she had harder time than ever. Sr. Magdalena also witnessed that, even then, Sr. Agnetta kept everything in her heart and prayed harder in silence and that she decided to live like a final professed of Missionary Benedictine Sisters in her heart since she was completely virgin, and she firmly resolved to live, work and pray for the glory of God alone. Sr. Agnetta always took care of all the official paper work with Sr. Magdalena Muro during the Japanese control. She also catechized the neighboring poor people with zeal, producing lots of baptized Catholics. She was always humble, bowing deeply even to the younger professed Sisters. When the Sisters were dispersed by the communists, she cared for the entire Korean Sisters’ whereabouts. Then she was left all alone. She worked in the Catholic homes for living but then she felt that her presence might make these families in danger. So she left them and got job in a brick factory. When the South with the UN army was pushing up and coming close, the communists captured Sr. Agnetta and put her into the prison in HamHeung. The Catholics respected her very much and wanted to protect her but the communists, who were retreating, decided to kill her. A communist police gave a very strong blow on her head with a heavy material. She was still breathing but the communist police threw her upside down into a well and retreated toward the northern border with China. When the UN army came, the Catholics looked for her among the countless corpses but she was not found among them. They drew out two corpses from the well and recognized her body. They realized that her time of death was not too long ago. They took her body to HamHeung Convent. At the entrance of the Convent, they said to her body, “Now we brought you to this Convent where you have been living.” As soon as they said this, surprisingly, real red blood trickled out of her nostrils. The Catholics who witnessed this scene thought that this red blood seemed to be the sign that she died of a martyr’s death. She had already been a martyr because she longed so much to become a real Sister at the Convent for the love of God but she couldn’t. Her life of enduring all the injustices of that time’s customs and senseless inhuman regulation seemed to be symbolized by the red blood. It was God’s sign to us the dull human beings, because she endured them all with love for her neighbors and especially for the love of God, her All.